No Star, but this site forced me to put one star to post my comment. I hate to say bad about anyone but this guy quoted me $625.00 to install all the idlers, pit man arm, brake pads, upper ball joints, and all other joints on my Blazer front end. When he inspected it he looked at the lower ball joints and said they looked good saying he seen they had been replaced at some time. Then because I had provided one sway bar end he had to get another one saying both needed replacing. As a result the bill went from $625.00 to $964.00! I confided in another mechanic shop who told me there is no way that work collectively could take 9 hrs so the amount he increased the billing for one sway bar end was ridiculous! That for that amount I had definitely been ripped off! In spite of my reservation I just paid him what he wanted as I was just glad to know the front end was all new and reliable. Then I noticed that when I braked there seemed to be a rumble. I went back and his mechanic said I needed new rotors. I didnt understand why they wouldnt have replaced them when they did the brakes, but got them to replace the rotors anyway because they were obviously in bad shape. I felt ripped off because any reputable mechanic would have recommended they be replaced when the pads were installed! This was another $154.00 After the job was done the mechanic showed me that the bottom left ball joint was beat and needed replacing! Then I was real pissed off! There was no reason for this after the shop owner had already told me they were okay when the whole front end was done 3 weeks earlier! Now he wants another $210.00 to do the lowers! This guy seems to have a habit of not telling a customer something needs replacing when it would be cheaper, and easy to do while other work is being done! That way he can get another costly repair for his shop instead of honestly doing the work when it would be cheaper for his customer! This is three times now that he has ripped me off by keeping repairs he knows need to be done to himself so that I had to go back and pay more for the repair! Please be warned not to go to Strawberry Auto if you want honesty, and integrity, with your repairs!! If you need more proof please contact me. I have the billings, with dates and amounts, to show you! Dec 03,2015 I would like to make an update to my above review regarding Strawberry Auto Repair. On Tues Rick (the proprietor) called me of his own initiative. He was very concerned to see my review and how angry I was. He assured me that customer satisfaction was an important issue for him, and that he deeply regretted the errors that led to my complaint. Forward from that Rick offered to make up for the errors by replacing my left lower ball joint free of charge, or return my money. I accepted his offer to replace the left ball joint for me free of charge, and on the following Thursday (today) he happily did as he promised. During the process of doing the lower ball joint something happened that caused the left speed bearing sensor to make the dash warning light to come on steady. I called Rick to ask about that. I told him that I had never seen that ABS light come on before now. He immediately said that he would call to get a new one to put on at his own expense. It seems that it was damaged somehow while changing the ball joint. I am convinced by Ricks sincere attitude, and effort to make things right, that he has a high degree of respect for his customers, and I am impressed with his integrity. I will return to have his shop do my repairs in the future. He has won my respect. I will change my star rating above in accordance. Brought my mini van in this morning because it was running real rough. Explained the symtoms to Rick and he suggested he put the diagnostics on and see if the computer would tell what was up. It said that there was an injector problem on cylinder 4. Upon opening the hood He right away saw what appeared to be a rodents nest on the manifold shroud, something I failed to notice when I had put oil in the van before leaving the house. He then said that it might not be injector at all because if it was rodents it may just be a chewed wire. I would have never thought of this in a million years. Off came the manifold shroud and sure enough the wires to the injector were chewed through. Only knowledge and experience could have picked that up. The problem was quickly repaired and I was back on the road in under an hour, only a little lighter in the pocket book. Even though the shop was busy, Rick took the time to listen to my problem and personally check it out, making my business feel important and appreciated. I will definately go back to Strawberry Hill Automotive in the future if I have any more problems! Our cars transmission broke down and Richard made a call to find a used replacement. Within 1 day, the transmission was repaired. During that time, Richard lent us a car for free. He even changed the oil dipstick (which was broken) free of charge. All in all, excellent service. Will do business again with Strawberry Hills Auto. I went to this shop today to get an out of province inspection on a 2012 cruze. The owner saved me money by telling me my car didnt need for inspection cause of the 4 years difference of the new bc law if that makes sense. He seems pretty honest too. 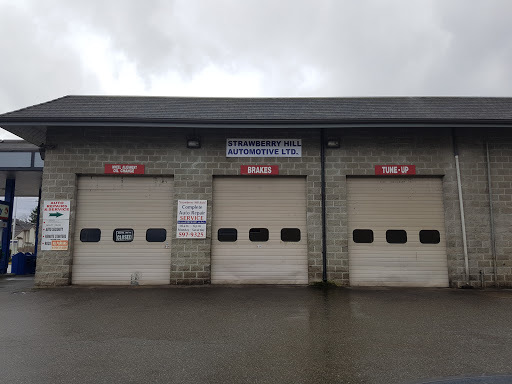 Ive used Strawberry Hill Automotive services twice and will use them again if needed (Hopefully not)! Rick and the rest of the team are great mechanics and know their stuff! Would recommend. Wow, for years I have been going to Midas and other shops. Im so glad I tried this place, I have found my new reliable, affordable mechanic. One of the best and most honest mechanics. Be sure to make a reservation as they are always busy. Great service over the years! Very honest and upfront! Highly Recommend!